Yesterday we woke up to a beautiful blue sky and completely still water. Liz and Isolda declined to go swimming so after a lazy breakfast we made our way across the bay to Alghero. 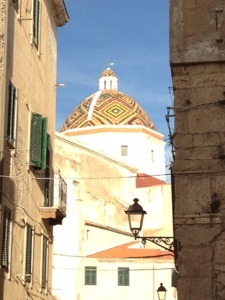 Alghero is an old fortified town with Catalan roots and we were able to moor under the old town wall. 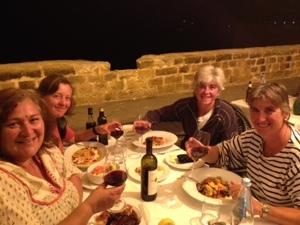 Liz and Isolda treated us to a lovely meal in a restaurant on the ramparts on their last night. We said goodbye to them very early this morning. We then decided to cycle along the coast to visit marinas where we might leave Nimrod this winter. All was going well until the forecasted storm broke overhead and we were thoroughly soaked! Very high winds are due over the next two days before our next set of visitors, Caroline and Val, arrive on Monday. Let’s hope the weather improves. 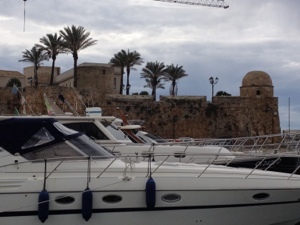 Pictures below of Alghero, the view from the marina and our meal on the ramparts.